Darling Ethel: Of course you remember the story of the little prairie girl. I always associate it with you. Well, again and again on this trip we would pass through prairie villages-bleak and lonely-with all the people in from miles about to see me. Among them were dozens of young girls, often pretty, and as far as I could see much more happy than the heroine of the story. One of them shook hands with me, and then, after much whispering, said: "We want to shake hands with the guard!" The "guard" proved to be Roly, who was very swell in his uniform, and whom they evidently thought much more attractive than the President... -from "Prairie Girls" Remembered today for his expansive personality and grand sense of adventure, Theodore Roosevelt-politician and soldier, naturalist and historian-was also a devoted, doting father and husband. This beautiful selection of the letters he wrote to his children over the courses of their lives, as well as a few written to other correspondents about the children, reveal a man deeply in love with his family and with the joys of fatherhood. The tales of Christmases at the White House and whistle-stop tours through the American countryside offer a cozy glimpse into one of the greatest American presidencies... and Roosevelt's tenderness with his sons and daughters-as he treats them as friends, confidantes, and equals-creates a warm and intimate portrait of one of the great American characters. 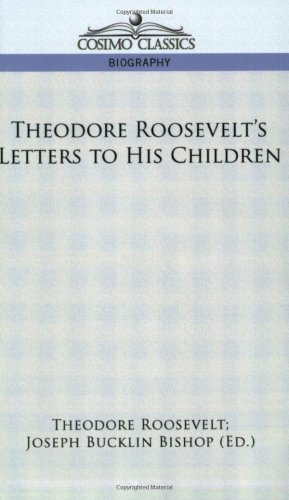 Also available from Cosimo Classics: Roosevelt's A Book-Lover's Holidays in the Open, America and the World War, Through the Brazilian Wilderness and Papers on Natural History, Ranch Life and the Hunting Trail, The Strenuous Life: Essays and Addresses, and Historic Towns: New York OF INTEREST TO: Roosevelt fans, readers of autobiography, students of the American presidency American icon THEODORE ROOSEVELT (1858-1919) was 26th President of the United States, serving from 1901 to 1909, and the first American to win a Nobel Prize, in 1906, when he was awarded the Peace Prize for mediating the Russo-Japanese War. He is the author of 35 books.